The new EBC variable frequency snake repellers available exclusively from Enviro Bug Control are solar powered units that keep snakes away in an environment-friendly way. Springtime is mating season for snakes when the males establish and guard their territory, making them even more aggressive and dangerous than usual and putting unsuspecting humans and animals at risk of attacks. It is vitally important to be aware of their presence and to employ various means to deter them away from areas frequented by humans and animals. Since snakes are highly sensitive to ground vibrations, stamping hard on the ground will usually warn them of human presence and repel them. EBC variable frequency snake repellers offer a low cost and very effective solution to repel snakes from around outdoor living areas, yards, animal pens, poultry sheds, breeding pens, bird aviaries and other areas. 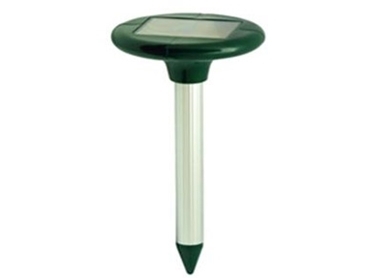 Very easy to install by inserting them into the ground, EBC variable frequency solar powered snake repellers function as an active deterrent against snakes.